Gripping the Esee Expat Cleaver leaves you feeling a little overwhelmed. You’re filled with the sudden urge to cleave things. There is something about its weight, its grip, and the fact you just know it can slice through most anything. It’s hard to put into words. Expat travels the world doing what I assume are fun and interesting jobs in dirty places. He has served as an instructor with Randall’s Adventure Training, Esee’s parent company. He’s an experienced outdoorsman, and his series looks to be an exciting development. The Expat CL-1 Cleaver is a beast of a tool and its design details are subtle. It’s more versatile than it looks. Don’t call it tactical. It’s not designed to be a weapon, and it’s not for mall ninjas. It’s primarily designed for food prep in the wild. In a pinch it can be used to do some moderate chopping and campground clearing. However, at the end of the day this is a tool for food prep. Calling this tactical is like calling a mess kit tactical. The Esee Cleaver is designed to take your meal from barely dead to ready to cook. It’s there to clean and dress animals as much as it is to prepare them for the skillet. Esee is well known for their brand of survival knives and tools. 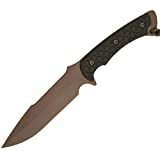 Dan has reviewed the Esee 3 and Chad has reviewed the Esee 4. I personally own an Esee 4, and the Esee Advanced Survival Kit. Esee designs the knives, but most are built by Rowen Manufacturing in Idaho. This explains the cutout of Idaho at the top of the Cleaver. The CL1 is made in the USA. It has an overall length of 11.5″, weighs 25.5 ounces, and has a 5.5″ blade. Speaking of blades, this one is massive. The cutting edge is 6 inches long, while the blade is 3.125 inches wide and .19” thick. It weighs a mighty, Mjolnir-like, 25.5 ounces. You can really feel the heft in this blade and it’s a good feeling. 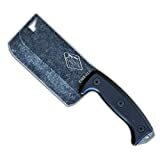 The cleaver sports a full tang construction with a black stonewash blade. The finish looks amazing and serves a critical purpose. The blade is made from 1095 carbon steel. It’s easy to sharpen and holds a nice edge, but it also tends to rust. Esee is up front with this. They clearly state that it’s your responsibility to bust rust and keep the blade clean. The only portion that will rust is the actual unfinished cutting edge. A light oil coating, and ensuring the cleaver is cleaned is important. Side note – Since this is a tool designed for making food you really don’t want to slap petroleum based oil like CLP on it. I like Citadel Black’s food safe knife oil for this one. If you look closely you’ll notice the blade isn’t fully square. The edge rounds towards the “tip”, and that provides some belly. This gives the cleaver a little more versatility and makes it more than a chopper. The rounded edge makes it useful for skinning game and detail work. You can also make fine and accurate slashes through meat with the CL1 like a kitchen knife. That rounded edge also allows you to ‘rock’ the cleaver to cut through veggies with ease like a kitchen knife. Without a doubt a kitchen knife would be better, but kitchen knives are made for the kitchen. The Expat Cleaver is made for the adventure. The pommel has a slightly extended tang designed for small crushing tasks, and it’s outfitted with a lanyard loop. A cleaver is meant to chop, and when chopping it’s important to be able to keep the cleaver in your hand. The lanyard hole makes it easy to tie the cleaver to your wrist when chopping. This way you walk away with all your toes. The Expat Cleaver features the same handle as the Junglas. However, unlike the Junglas the handles on the Expat Cleaver are made from G-10 rather than micarta. G-10 is a proven handle material that’s resistant to the harsh nature of the great outdoors. Environments with moisture, heat, and questionable cleanliness aren’t an issue for it. This peel-ply G-10 is also grippy, so the cleaver stays put in the hand. This is important for a tool that’s doing chopping work. The G-10 grips are mated perfectly to the tang and are completely flush. Three massive Allen head screws hold the grips in place. Even after months of use they haven’t loosened. The grip features an excellent wave that gives you a nice and comfortable grip. The bottom and top of the grip are curved to keep your hand centered and provide a comfortable pivot point. The handle on the Junglas is a known quantity, and it was a no-brainer to bring the design over to the CL1 Cleaver. The handle is also a fat bottom girl and fills my XL paws nicely. The wide grip really helps disperse the shock of hitting something hard over and over. The shock travels throughout the entire handle instead being focused in one area. This reduces fatigue and prevents pain. “Sheath” is a bit of a generous term here. The Esee Cleaver comes with a leather blade cover, but I wouldn’t call it a sheath. It simply goes over the blade and protects it from you and you from it. Personally, this isn’t a big deal to me. This isn’t a tool you carry on your belt for immediate use. The cleaver is kept in the pack until it’s needed. The blade cover is made from a tough leather that secures via a simple button. For what it’s worth, it looks nice. I would have liked to see some type of tie down point. This would be handy to make sure the leather cover isn’t lost when the tool is used in the wild. If I could tie it to the pack I keep the cleaver in, I’d be good to go. Even after owning the Esee Expat Cleaver for months I still get excited when I pick it up. I’ve used it lop the heads off fish, cut branches down, and chop up meat, veggies and more. Something about its size and weight makes it a blast to use. I find myself finding excuses to use it when cooking. Do I really need a cleaver to cut up chicken breast? No, I don’t, but I like using it. I recommend purchasing the ESEE CL1 Cleaver at Amazon or BladeHQ. Please consider that purchasing anything through any of the links on this website helps support BladeReviews.com, and keeps the site going. As always, any and all support is greatly appreciated. Thank you very much. Editor’s Note: Please join me in welcoming Travis Pike as a new contributor to the site. Travis has written in the guns, gear, survival, and self-defense realm for years, and is looking to expand his writing to include his interest in knives. In addition to writing for years he is also a United States Marine infantry veteran, so he has plenty of real world experience. I think he’s going to bring a very practical approach to his knife reviews. Plus, you know he has excellent taste when his first review is of a cleaver. Welcome Travis! Spartan Blades has a reputation of producing a premium product geared towards military applications. Founded by a duo of retired Special Forces operatives, I always considered Spartan Blades to have a unique position in the market. Their approach is simple: manufacture high end fixed blade combat knives in the USA out of premium materials. The only other company that shares this approach and readily comes to mind is Chris Reeve, and CRK is best known for their folding knives. Spartan Blades has since branched out into high end folders, but I will always associate Spartan Blades with high end fixed blades. And the Horkos is arguably Spartan Blade’s flagship fixed blade knife. It may not be the most expensive, but it strikes me as their most approachable model and emblematic of their lineup as a whole. This knife was apparently commissioned by the Combat Weapons Team of the United States Military Academy in West Point, NY and is given to graduates of their elite program. A review of a Spartan Blades knife is long overdue, and given its pedigree the Horkos almost begs for evaluation. This knife was provided to me for review by Spartan Blades. The Horkos has an overall length of 10-7/8″, a 5-11/16″ blade, and weighs 9 ounces. Like all Spartan Blades the Horkos is made in the USA. This is a combat / utility knife. Versatility is the name of the game with a combat knife. Obviously it needs to be capable in a defensive role, but most of the time the knife will be used for utility work. So it needs to be a practical knife, but still capable in a defensive role. I consider the Horkos to be an evolved Ka-Bar USMC knife. Of course I’m a mild mannered suburbanite, so my experience with the Horkos has been purely as a utility knife. And thankfully the Horkos is a practical enough tool that I could effectively test it. The Horkos sports a modified drop point blade with a dramatic harpoon tip. Spartan Blades has incorporated the harpoon tip on a number of their designs. It’s a nice aesthetic touch and lends a nod to the Spartan warriors that the company was named after. Beyond the harpoon tip you have a fairly typical partial flat grind and swedge. There is a little bit of belly, a nice strong tip, and plenty of cutting edge. The grinds on this knife are beautiful. In fact, all the machining is top notch. My favorite feature of the knife is that all the edges have been chamferred. This detail provides a premium feel and distinguishes the Horkos from all the other knives in my collection. The Horkos is made from a single piece of S35VN steel. Although I have tested dozens of folders with S35VN blades before, this was my first experience with a fixed blade in S35VN. At 3/16″ (~4.75mm) thick, this is a substantial knife. I have come to appreciate S35VN in folding knives, but was unsure how it would hold up in a knife like the Horkos. After all, a blade of this size will need to hold up to the rigors of chopping, prying, and perhaps even batoning. Spartan Blades offers the Horkos in a black DLC coating or a tan Zirconium Nitride (ZrN) coating shown here. Although the ZrN coating is described by Spartan as a “flat dark earth” color it seems to me more like a metallic brown gold. It has an almost etheral sheen to it. It’s subtle, but also totally different from something like a flat brown powder coat. I was curious to see how this ZrN coating and the S35VN blade would hold up under use. I first used the knife on some cardboard. This is a thicker grind, and thick stock, but the keen edge cleaved through cardboard as you would expect it to. You will never mistake the Horkos for a kitchen knife, but it cuts cleanly and gets the job done. The coating and edge both held up fine. I then worked with the Horkos on some seasoned oak logs that I keep for camp fires and grilling. The grind on this knife is pretty stout, but it handled the oak capably, shaving away the bark and and then peeling off thick curls of wood. I chopped quite a bit, performed some light batoning, and then moved to a large stump of grapefruit wood. Grapefruit is much softer than oak, but it allowed me to drive the tip of the Horkos deeply into the stump and test the tip strength. There was no edge deformation and the tip held up perfectly. I have since used the Horkos on several other occasions. Mostly breaking down boxes and prepping wood for fires. It continues to be a capable tool. The ZrN coating also held up well. There is some light surface scratching (perhaps from rubbing up against bits of sand on some of the wood), but the coating remained largely intact. It didn’t peel off like a teflon coating or flatten out like a powder coating. ZrN is a premium coating and I’d say it performs close to DLC. I also like how this coating does not bind up or effect the cutting ability of the knife. I am keeping this knife for long term testing and will update the review as I gain more experience with this knife. The Horkos is a full tang knife overlayed with textured micarta handle scales. Once again everything has been thoughtfully designed and meticulously executed. I cannot find fault with the material selection or the fit and finish of this knife. The scales on this knife have a large diamond pattern texture to it. I was concerned that this would make the knife uncomfortable to use. In fact the number of ergonomic features on this knife had me concerned: the beak of the pommel, the finger groove on the handle, and the saw cut jimping on the thumb ramp, and this aggressive diamond texture. I was pleasantly surprised to not develop any hot spots after extended use. While this won’t handle like a purpose built bushcraft knife, it still handles well. All the ergonomic features aided in the grip rather than getting in the way and I walked away from my testing sessions appreciating the Horkos more. The Horkos comes with your choice of a Kydex or Nylon sheath. My particular knife came with a nylon sheath in multi-cam. This is one of the most robust nylon sheathes I have owned. This is high denier nylon, triple stitched, molle capable, and threaded with paracord. The retention strip is adjustable and backed with velcro. This is a high quality sheath and strong departure from the bargain bin cloth sheathes you get with budget knives. The plastic insert is lined with what appears to be the loop side of velcro. This gives the knife a secure friction fit, even if you don’t use the retention strap. There is a velcro lined belt loop at the top of the sheath, and a thick plastic D-ring at the bottom, so you can carry this knife in a number of different ways. The kydex sheath is a $30 option and is probably worth the extra money, but I think as far as nylon sheathes go this is about as good as it gets. The Horkos is an impressive combat knife. At over $300, this is a high-end product. The materials are top notch, every detail has been considered, and the knife performs. I think this is an instance where you get what you pay for. It’s overkill for a backyard bushwacker like myself, but if I needed to carry a combat knife on a daily basis I think the expense is easily justified. You certainly get something more for your money over a $100 knife. I have enjoyed experimenting with a 10″ S35VN fixed blade. I continue to be impressed by the qualities of this steel. The combination of good edge retention and easy sharpening make it tough to beat. And I was also pleasantly surprised by the mild nature of the handle. If I had to pick apart the Horkos, I think my approach would be more of a general commentary on combat knives. Combat knives ride that precarious line between utility and defensive use. It’s an exercise in compromise, and compromise by it’s very definition won’t leave everyone 100% happy. If you are looking for a pure utility knife to split wood all day I might suggest an axe or a Fallkniven A1. If you are looking for a straight up fighting knife, then the something like a ROSarms Kisten would probably be a better option. But the Horkos still does a good job of riding that line between practical and tactical. There is no compromise in the materials, and the design is refined enough to get all manner of jobs done. If you need a tough, do it all utility / combat knife then you will be hard pressed to find a finer tool than the Spartan Blades Horkos. I recommend buying the Horkos at Amazon or BladeHQ. Please consider that purchasing anything through any of the links on this website helps support BladeReviews.com, and keeps the site going. As always, any and all support is greatly appreciated. Thank you very much. It’s not every day I get to share a new manufacturer. I was recently approached by Robert Yates with Arthos Knives about checking out his new line of fixed blade outdoors knives. Robert is an engineer by day, who decided to take the leap and start his own knife company. I think basically anyone who enjoys knives long enough eventually dream of designing their own knives, or starting a knife company. I thought it would be interesting to see what he developed, and I told him I’d be happy to check out his new knife. Arthos stands for “The ART of Hunting, Outdoors, and Survival”. This drop point fixed blade is the only knife in their catalog currently, and it does not have a name. I will refer to it as the “Arthos” throughout the review. The Arthos has an overall length of 8.6″, a 4.0″ blade. The handle and sheath are made in the USA while the blade is made in China. The knife is finished an assembled in the USA. The Arthos is geared towards the outdoors crowd. It is a little bigger than my ESEE-3. This could be a good camp knife. It’s big enough to do some light chopping and batoning, but small enough to carry around on your belt without issue. I’m not a hunter, but could see it being used in that capacity. The Arthos has a simple drop point blade. This classic blade shape is capable and versatile. The edge is almost a continuous belly ending in a strong tip. Arthos went with a saber hollow grind. It makes for a strong knife. I tested this knife on some seasoned oak firewood, bamboo, 2x2s, and green wood. The Arthos came sharp, and is a good carver. The uncoated blade peeled off thin slices of wood with ease, and did a good job limbing small branches. I am a little spoiled by heavy duty convex ground blades like my Fallkniven A1, and Bark River Bravo 1 (to be reviewed), but for a mid size knife I felt like the Arthos held its own. The tip is strong and held up under some light prying. I also did a little batoning with the Arthos. The relatively thin and short blade don’t make this a great choice for batoning, and neither does the saber hollow grind, but the blade held up to the beating and I was able to pop apart smaller diameter pieces of wood. Arthos decided on D2 steel for their fixed blade. D2 is a good choice for a camp knife. It’s tough and it holds a good edge. D2 has a reputation for being stubborn to sharpen, but I haven’t noticed any issues with this simple blade shape. In fact, the Arthos sharpens up nicely on my Lansky Crock Sticks. D2 is a semi-stainless steel, so it will stain and it may rust if you aren’t careful with it. Arthos does offer this knife with a black coating, which may not be a bad idea for humid environments. Robert mentioned to me that it always bugged him how the handles on knives felt like an afterthought. Here he wanted to give the handle special attention. I gotta say he did a great job with it. The Arthos features a fully contoured CNC machined G10 handle. These were done by Stoner CNC, and they did an excellent job. I will note that there is no locktite on the torx hardware. If you plan on using this knife spiritedly you will want to add some thread locker prior to taking it out. Arthos offers their knife with a variety of color options. The scales are held in place with T-10 torx bits. As you can imagine, the handle feels great. There is plenty of palm swell to support your hand, and your fingers fall naturally into the countours of the handle. There is a short run of jimping on the spine of the blade. Personally, I feel that the jimping is too sharp to be useful without gloves. On the bare thumb the jimping is painful for any kind of serious cutting. Beyond that I found the handle to be comfortable. I think the choice of machined G-10 handles kicks things up a notch on the Arthos. The sheath is another part of the knife where Arthos went above and beyond. The Arthos features a hand fitted custom kydex sheath. This pancake style sheath has been nicely finished; no sharp edges and a generous drain hole. The blade pops out with the deliberate push of a thumb, and slides back in with a satisfying “thwack”. There is no rattle or wiggle. Arthos also included a Tek-lok pre-attached to the sheath. This is an expensive add on to include, and makes the sheath easy to attach to a belt. At this price point you will be hard pressed to find a knife with a nicer sheath. For a first offering, I think Arthos did a great job with their D2 hunter. The handles and sheath are top notch, and serve to elevate the basic blade. I can’t think of anything else that has handles and a sheath as nice as the Arthos at anywhere near this price point. The blade is serviceable, but pales in comparison to the sheath and handles. The grind is basic and I am not a fan of the jimping, but the blade performs well and the D2 steel is a good choice for and outdoor fixed blade. If I were to offer Arthos Knives some constructive criticism, I’d recommend upgrading the blade. I might suggest thicker stock with a full flat or higher grind, and perhaps bringing the manufacturing of the blade over to the USA. It may significantly increase the price, but at that point you would have a truly premium product, and I think the handles and sheath justify it. As it stands I think this an impressive first offering from a new company. For those that are interested in this knife, I think that the Arthos provides a lot of value for money, and the exceptional handles and sheath distinguish it from a competitive market. I’d recommend it. I recommend purchasing Arthos Knives directly from the manufacturer or at Amazon. Please consider that purchasing anything through any of the links on this website helps support BladeReviews.com, and keeps the site going. As always, any and all support is greatly appreciated. Thank you very much. Hogue is something of an odd brand in the knife industry. Despite their award winning designs, the Hogue line has never really caught on with the majority of the knife community. It could be that they produce button locks whereas consumers [think that they] want framelocks. Or perhaps the market is too caught up in the frenzy over flippers. Whatever the reason, Hogue is a company that rarely gets the praise or online attention it deserves. Like its brethren, the EX-F03 is not a trendy knife. Pictures of it won’t clog your Instagram feed. BladeHQ won’t generate a feeding frenzy by announcing a shipment of EX-F03’s has arrived. It certainly won’t scratch the itch behind the EDC top and the torq bar. At the end of the day, it’s a working knife in a market driven by collectors and aficionados. As a collector (and a nonstop fidgeter) I’m guilty of both sins. Whatever the case, the EX-F03 seems to have slipped under the radar. Hopefully this review remedies that. Before the review really begins in earnest, there’s a bit of a cautionary tale/PSA I should share. Always check state and local laws before purchasing a knife. CA Penal Code 21310 forbids carrying a concealed “dirk or dagger,” which I belatedly discovered applies to all fixed blades. It cuts me deeply that I can’t carry a knife that I [spoiler alert] really like outside of my home. What really twists the blade is that this was a gift from my girlfriend. I’d like to say that it being a gift hasn’t affected this review, but she reads my work here, and I’d rather keep my blood inside of my body. Out of the sheath, the Hogue EX-F03 has a cutting edge of 2.25”, an overall length of 5.5”, and a weight of 2.1 oz. In the sheath, the knife is 6.5” long, 2.5” wide, and weighs just under 4 oz. The blade stock is .16” thick. Judging by size alone, the design intent of the EX-F03 is a small utility blade. It’s also available as a dedicated belt knife, which includes a screw-on handle with a karambit style ring incorporated. Of note is that the aforementioned belt version includes the neck sheath as well. Both handle styles of the EX-F03 are available with a hawkbill blade, if you’re so inclined. The EX-F03 has what Hogue calls a clip point. It doesn’t look like any clip point I’ve ever seen, but one thing’s for sure: the folks at Hogue know how to manage a grind. It’s even and crisp, and the blade stock is thin enough that it cuts well. The blade is a bit short for food preparation, and I’ve learned the hard way that stubby blades can be hazardous at times. Pro tip: don’t try and slice a palmed apple with something this size. It doesn’t end well. At first I thought the tip was too thin, but some pretty extensive use has shown me the error of my ways. It’s not as durable as an ESEE or a Becker, but I found the thin tip perfect for working with tough materials that tend to bind, such as foam board. Conversely, I was a big fan of the continuous belly on the EX-F03 in theory, but in practice it tends to slip out of the aforementioned tough cutting mediums. Not that it’s a poor cutter – quite the opposite – but some finesse may be required. The EX-F03’s skeletonized construction is as simple as you can get. As such, the EX-F03 really has only one problem: it’s too thin. Yeah, I know. Go figure. Remarks from Captain Obvious aside, without the presence of some contouring, harder cuts press the tang into the palm, which in turn generates some discomfort. That said, I’m looking for a knife that fits into my pocket comfortably, and the extended grip is too long for that. If you have access to some basic tools, you could theoretically purchase the full version and grind off the ring (Allen Elishewitz spoke about doing just that). Bear in mind, that sort of action will void your warranty. All that said, I like the overall design. It’s a 3-finger grip, but the included lanyard gives your pinky something to hold onto. The curves of the handle, although thin, nestle organically into the palm. And I have to hand it to Hogue’s machinists: they made a bare piece of steel as comfortable as they could. Everything is chamfered and polished. The jimping is hands-down some of the nicest I’ve experienced, with thick, rounded ridges that lock your thumb in place without generating hotspots. It all boils down to intended use: if you want to carry a fixed blade in your pocket (rather than on your belt), chances are you value discretion and ease of carry as much or more than the ergonomics. If you do need a blade that can handle prolonged use, it’s probable that you can carry said knife on your belt without rubbing anyone the wrong way. The sheath of the EX-F03 is truly sublime. Apart from a loose rivet – which Hogue fixed promptly – I have no complaints. If you keep up with Gear Geeks Live, you’ll have an idea how rare that is. There is a firm snap upon sheathing and unsheathing the blade, and no wiggle in any direction while stored. It’s made of Boltaron, which is similar to but slightly tougher than Kydex. I own a couple custom fixed blades and have handled my fair share of productions, and this sheath outclasses all of them. Through some witchcraft, it’s bidirectional and accommodates both blade shapes. One slight downside: you can (with some effort) pop the sheath off with your thumb, but for me it’s mostly a two-handed affair. I don’t know if that’s a deal breaker for some, but I don’t mind. As shipped the EX-F03 is a neck knife. While I’m reasonably certain that it would serve well in such a role, I don’t work in an environment where that would be appropriate. For the sake of due diligence, I wore it around my neck once or twice, and it worked fine. Deployment was easy and the cord was comfortable. Even so, the cord was removed at the earliest opportunity. To my delight I found that the EX-F03 carries wonderfully in the pocket. The sheath is wide enough that the blade doesn’t roll or bind in the pocket, and rounded enough to fit into a variety of pants without issue. On a few weekend trips up into the woods, I wore it on my belt with a spare Tek-Lok I had lying around, and it worked fine. The dedicated belt sheath is clearly superior, but in a pinch this did the trick. All told, the EX-F03 is an impressive addition to the Hogue line. By now you should be able to tell I’m overly picky, so of course my jimmies will be rustled by the little things. (Hell, if you don’t see a complaint, call the authorities. It may be a cry for help.) The few flaws present are honestly quibbles, and can’t hold back what I think is a strong competitor in the world of fixed blades. Speaking of competition: the price point of the EX-F03 is a major departure for Hogue. Typically their knives clock in at $150 and up, but this configuration of the EX-F03 costs just under $70.00. Some may still consider this expensive for a small fixed blade. Depending on what extras you want, the ESEE Izula falls at a similar price point, but I think the costlier steel and stellar sheath are well worth the price of admission for the Hogue. If you’re looking for a pocket fixed blade, you should start here. Much like traditional knives, a good carry option determines if the knife in question actually gets pocket time. In this regard, the EX-F03 is unmatched. I couldn’t fault anyone for looking elsewhere, and the competition is very strong, but the sheath of the EX-F03 is so well-suited to pocket carry that it at least should be part of the conversation. Whether you’re a veteran to the world of fixed blades, or a green recruit, I can wholeheartedly recommend giving the EX-F03 a chance. If you live in California, well…shell out for the belt sheath. I’ve heard good things. Editor: If you are thinking of buying a Hogue EX-F03, please consider purchasing it at Amazon or BladeHQ. By purchasing things through any of the links on this website you support BladeReviews.com, keep the website free of annoying banner ads, and help produce future reviews. Thank you very much.